Country Ways is a story about the passage of time, from a Norman invasion to a narrowly-avoided German one. It tells of the joys and hardships of life in rural southern England through the seasons and through the centuries. It relates how a family coped with poverty and penury, and how a daughter became a millworker, a lady’s maid and eventually the author’s mother. The tale is set in and around the town of Chard in the West Country, although many of the events described could have taken place almost anywhere in England. The family in the spotlight, the Collins family, were in the main men of the soil and women who toiled at home. Some were miners, made shoes or clay pipes, or repaired machines for the two main local industries, weaving and butter making. Their lives, and the lives of the community around them in a rural England which is now largely forgotten, are brought vividly and touchingly to life through this well-studied and meticulously-documented tale. 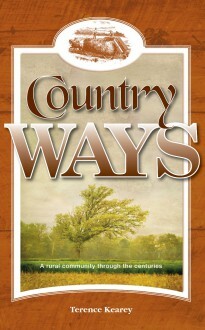 Country Ways is the first in a quartet of books by Terence Kearey dealing with aspects of life in Britain through the centuries from the perspective of his own family. The others are History, Heroism and Home, A Changing World and A Distance Travelled. The author is working on a screenplay based on the first three books and a definitive account of the Gommecourt Diversion discussed in History, Heroism and Home.